1200cfm with pre-filter, carbon filter and 99.97% efficient HEPA filter. The 1200 HEPA Shield is the newest addition to the well known, high performance line of HEPA systems. The 1200 HEPA Shield incorporates a new high performance blower/motor package providing excellent air flow performance. The 1200 HEPA Shield unit is a single piece system designed to be used in a variety of applications. 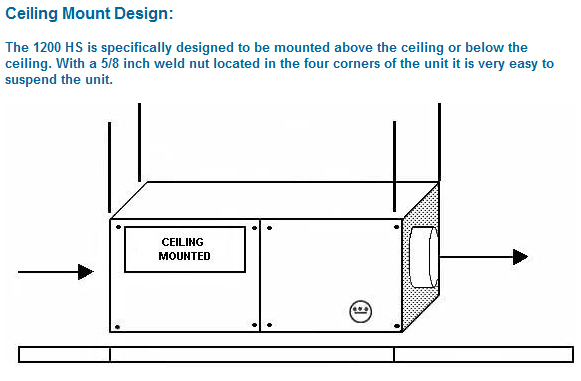 It can be easily mounted from any ceiling area as a stand-alone system or even mounted to an HVAC system in the bypass approach. 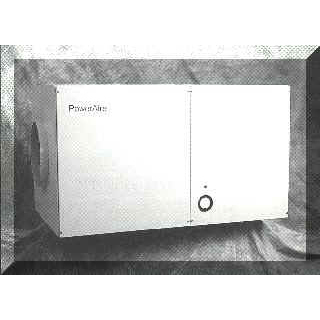 This unit can provide 1200 cfm of HEPA filtered air or it can be used strictly as an odor adsorption or VOC reduction system. » 4. Optional 95% DOP & 95% Ashrae Filters. » The 1200 HEPA Shield unit can be easily mounted in any ceiling area, as a stand-alone system, or attached to any HVAC system. » The powerful 3/4 HP motor produces over 1200 cfm of HEPA filtered air. » Available in straight thru or angle arrangement. » Integrates into the heating/cooling system. 1200HS PLUS Options: » Adaptation of 1200HS base unit allowing for two speed operation with programmable home thermostat. 1200HS Stand-Alone Options: » Adaptation of 1200HS base unit used to tie into a separate system without a thermostat. 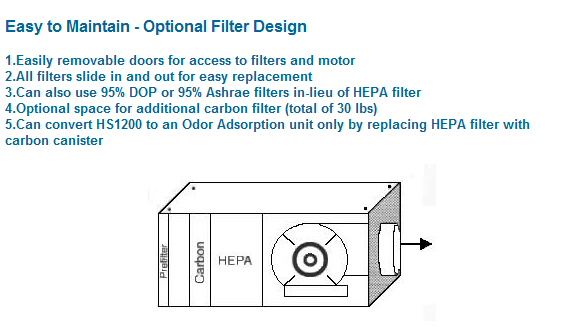 1200OA Options: » Contain up to 80lbs of carbon for odor adsorption and no HEPA filter. Used for odor control. 1200OA PLUS Options: » Adaptation of 1200OA base unit allowing for two speed operation with home thermostat. 1200OA Stand-Alone Options: » Adaptation of 1200OA base unit used to tie into a separate system without a thermostat.